The Funky Felter: I want a copy of this book soooooo badly! I want a copy of this book soooooo badly! 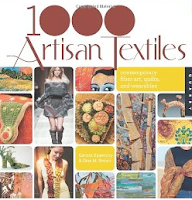 After seeing Andrea Graham's post about it on Facebook, I looked up the book 1,000 Artisan Textiles: Contemporary Fiber Art, Quilts, and Wearables. Now I'm drooling over the sample pages that I saw on its Amazon listing. It looks like it is filled with wonderful felted creations - such awe inspiring photos!! I'd love to get my hands on a copy for my collection of felting books. Although, with diapers, formula, etc., on the top of the list to buy right now, I think that I'll have to wait just a little while, but someday it will be mine! Hi Shalana! This is a wonderful book! I'm drooling with you! I also looked up Andrea Graham - oh my gosh, what a felter!!! I'd love to own one of her pieces, too. Imagine that - seeing someone else posting about this book! I'm in it .. I haven't seen it yet and am waiting - rather impatiently :) for my order to arrive. I'm off to Amazon to see what I can see. Connie, I LOVE Andrea's work - so inspiring! oh, yes, that books looks fabulous! it's going on my christmas list (only 7 months away! ).